Starting Thursday, we will embark on a full court press of the New York Comic Con. Check here all weekend and into next week for interviews, news and highlights. Follow us on twitter too as we’ll be updating live from the panels and more! Cartoon Network isn’t playing around, sending most of their Adult Swim lineup to New York. On hand will be talent from Robot Chicken, Venture Bros, Superjail, and the upcoming miniseries The Heart, She Holler starring Patton Oswalt and Kristen Schaal. 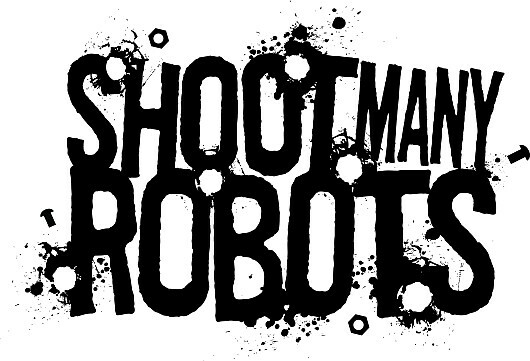 We’re going to demo Demiurge Studios’ upcoming action-RPG Shoot Many Robots. So far it looks like it has a little Metal Slug in it. If so we’re in for a downloadable treat! Activision will have a number of titles headlining their booth (I won’t get into X-Men Destiny) centered around the soon-to-be-released GoldenEye 007: Reloaded and PROTOTYPE 2. Hopefully we can get some information on the new Transformers game as well. With all of the 80s cartoons and shows coming back, it was only a matter of time before Voltron made it’s presence known again. Will new toys, a THQ video game, comic books and a new TV series, we’ll see just how much Voltron I can handle before I throw up. Fans have been waiting years for the Avengers to assemble on the big screen, and with the trailer debuting this week it’s that much closer to actually happening. Chris Evans, Tom Hiddleson and Cobie Smulders will be on hand to debut some new footage from the movie, and most likely start the biggest nerdgasm of the weekend. We’ll have that and plenty more to talk about from games, to movies, and even comics (this is a comic book convention after all). So don’t forget to check the site periodically for videos, stories, and more! X-Men Destiny came out this week to mediocre reviews. The choice system has no impact, the enemies are repetitive, the game is too short, the list goes on. However, one decision made it almost impossible for this game to really take off from the start. The playable characters. Before I go any further I should probably mention that despite by love of comic books, I have not played, nor have I even considered playing, X-Men: Destiny. My critiques have nothing to do with the controls or graphics (I’m sure both are well covered by better writers than myself). I am simply detailing why I had no desire to play it before, and certainly don’t now. 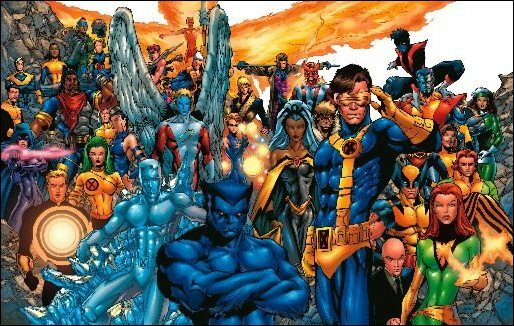 If you are playing an X-Men game, the first thing you probably want to do is be your favorite characters. It was made pretty obvious early on that that is not the case here. Instead you play as a new mutant (no, not those new mutants), who recently discovers his or her powers and has to decide whether to join the X-Men or the Brotherhood of Evil Mutants (should be a no brainer considering one group has the work “evil” right in the middle of it but whatever). This isn’t a bad idea at a glance. Being an unknown character can give you the ability to put yourself in the role of the young mutant, gaining cool powers while fighting among and against your favorite heroes and villains. I was initially on board with this game, thinking it was Marvel’s answer to DC Universe Online, where you create a hero or villain from scratch and fight among all the characters in famous DC locations. Boy was I wrong. Starting from the top, you have the choice to be 1 of 3 mutants. A regular guy, a beefed up guy, and a girl. You also have a choice between 3 powers, none of which I will name because they are all the same. It turns out it doesn’t really matter what character or power you choose because they are all basically skins for the same generic person and actions. For a game claiming to be all about choosing your destiny, there already isn’t a lot of choice here. As for choosing sides, it turns out that doesn’t really matter either. Both sides are going against a third party that is out to get all mutants. This makes for a pretty cheap way to make all you good/bad choices not mean a thing. Essentially the only thing your choices do is determine who “helps” you on all of your missions. Regardless of your chosen character you have two endings, which are solely determined by the final choice you make. 3 characters, 3 powers, 2 endings. Doesn’t really add up. Who wouldn't want to be buff guy? Or girl with scarf? None of this is unprecedented, but it doesn’t really give anything back either. Ultimate Alliance 2 didn’t change too drastically based on your decisions, but you at least got different cut scenes and played as your favorite heroes. Force Unleashed left you has an guy you never heard of with no choices, but you go against famous Star Wars creatures and characters, and you get all the force powers you ever dreamed of having. You don’t get optic blasts or psychic powers in X-Men: Destiny. All you get are 3 random powers that seem to all be identical extensions of your fists, which you use against random people you never heard of, as a person you don’t care about. That game has been done much better twice before, Infamous and Prototype. Considering Ultimate Alliance and X-Men Legends, I get not making another beat’em up where you play as Marvel characters. However the model for this game really should have been DC Universe Online. I would have loved the ability to create my own mutant, with an actual costume and powers of my choosing, while actually fighting against X-Men characters. With 3 different, although generic, characters the potential was there for 6 possible outcomes. Good and bad. Instead we got 2, with a short play through time to go with it. Would it really have been so much trouble to throw in flight? Today the Mets defeated the Reds 3-0 in the final game of 2011 at Citi Field. Miguel Batista threw a complete game 2 hit shutout. Mike Baxter, a Queens native, hit his 1st career home run. But the real story of the day was Jose Reyes. Reyes went 1 for 1 with a lead off bunt single. That’s it. That’s it for his season, as he was trying to win a batting title. That also might be it for his Mets career, as he will enter the off season as one of the most sought after free agents on the market, with the Mets not necessarily having the money to spend on him. I was all ready to write a post blasting Terry Collins for pulling Reyes just so he could get a batting title. But then it came out that Reyes told Collins he wanted to be removed if he got a hit in the first. That changes everything. The internet has been buzzing about how Reyes decided to pull himself after getting that 1 hit, putting his batting average at .337, enough to win the first National League batting title in Mets history. He’s being heavily criticized for winning it in a cheap way. Especially on the 70th anniversary of Ted Williams risking his .400 batting average by playing both games of a double header (he would go 6 for 8, raising his average to .406). However I don’t care about batting titles. The last time I checked the only thing you got for a batting title was a pat on the back and maybe a bonus check (both of which Reyes has enough of). I do care however about the 28,816 people that were in attendance today, A decent number for a team full of replacements playing the last game of the year on a Wednesday afternoon, 90% of which were there specifically to see Jose Reyes one more time. Reyes was in the lineup for a total of 12 minutes (trust me, I checked). That means that if you were 15 minutes late to the last game of the season, possibly your first of the year, you completely missed seeing Jose Reyes at all. Sure he was brought out for a curtain call, but no one goes to games to see players wave. They want to see players play. If he comes back, then that moment stands as a mere side note to one of the greatest single seasons a Met has ever had. However if he doesn’t, his last game as a Met will be as anticlimactic as it could possibly have been. Overall today did not change much. 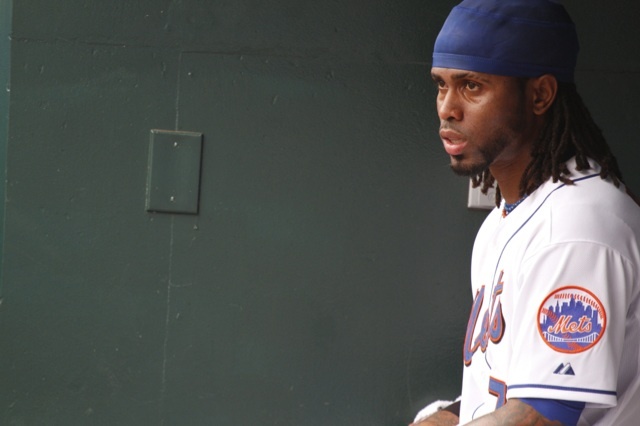 I still want Jose Reyes back. I still can’t blame him if he decides to chase big money or go to a better situation. It’s just a shame that the little bit of selfishness he displayed tarnished a Mets career that has been almost all about a team first attitude, putting Reyes among the most popular Mets of all time. It may be a little cheap, but batting titles are unique and Reyes is justified in wanting to win one. Doing it in spite of the fans that have supported him for the last 9 years however, is not fair to both the fans and Reyes. 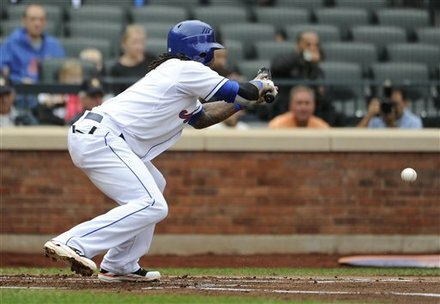 Hopefully next year, Reyes can make it up to the Mets faithful by being in the lineup for them on opening day 2012. If there is one thing I like in my food it’s everything. I’m big on combining my foods to create one explosive delicious bite. 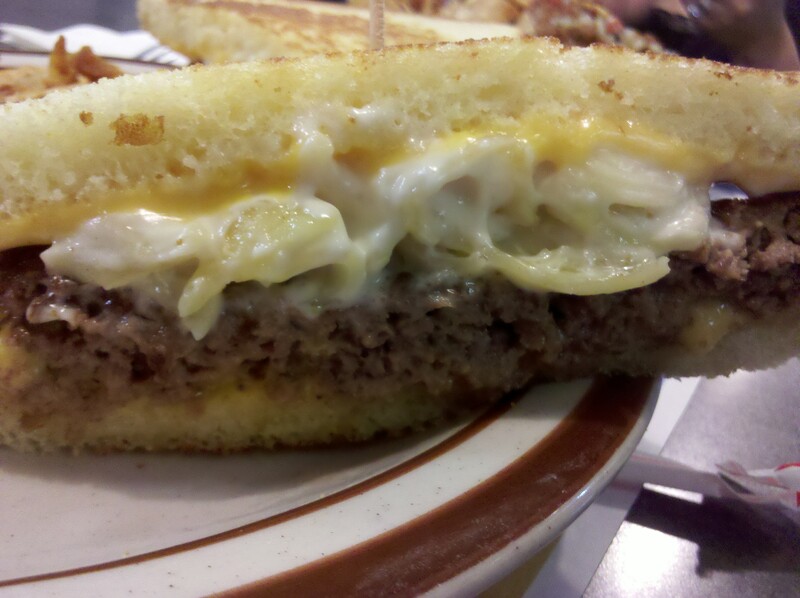 Well it turns out the people at Denny’s can read my mind because here is the Mac ‘n Cheese Big Daddy Patty Melt. How about an ingredients roll call? 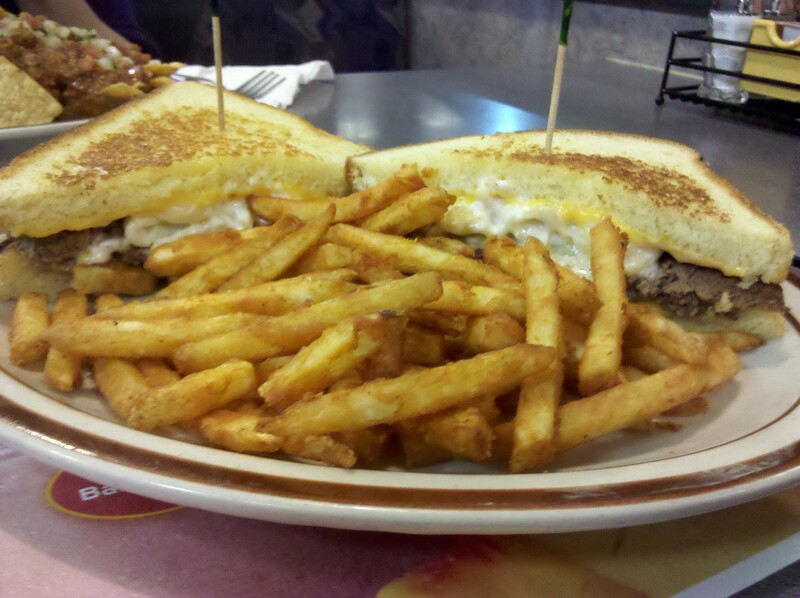 Throw in some seasoned fries and you got yourself a whole lot of tasty. You also have a whole lot of calories on your hands (1690). But as we all know, calories are delicious so bring it on! But how good is it really? On their own the parts are just so so. The Mac ‘n Cheese is creamy but plain. The patty is your basic burger patty. Cheese is cheese and so on. But together, the damn sandwich comes alive. There is just enough Mac ‘n Cheese in each bite so that you know it’s there, but not too much that it overpowers the beef or the cheese. Every element compliments each other, and impressively, it doesn’t fall apart when you eat it. Also impressive is the portion size. Not that it is big, but that it is just right. By the time I was done I was not stuffed, but I sure was satisfied. Well done Denny’s. I’ll see you again the next time I’m driving through New Jersey in the middle of the night. Everybody seems to be going crazy about how terrible the changes George Lucas made in the Blu-ray release of the Star Wars saga. Did anyone not buy it because of that? To be honest I’m not buying because not that long ago I bought them all on DVD and can’t spend 80 bucks on the same six movies every two years. The only new change that really makes a difference to me is Darth Vader repeating one of the most hated one syllable lines in movie history. Blinking Ewoks, new chants, same difference.